For our first May Lunch&Learn we saw Richard Hall, the director of QMS Consultancy, talk with us about medical devices (MDs). With 25 years experience of working in the medical device industry including designing his own IVD device, Richard spoke to us about his experience of the CE Marking process, and how the regulations are changing and what digital health startups need to be aware of. The MD industry seems to be accelerating as we enter the digital age. More and more devices are being developed with new materials and new scientific principles and the regulatory world is running to catch up. All this has led to greater oversight of the MD manufacturers by the Notified Bodies and of the Notified Bodies by the Competent Authorities. In short, it’s getting harder and harder to launch new devices, not just in Europe, but in the world in general. What is a Medical Device (MD) and an In Vitro Diagnostic Medical Device (IVD)? Richard then shared a useful slide, using blood storage as an example, as to whether something was a MD or an IVD. As you can see from the example, it’s a complex area. The letters "CE" are the abbreviation of French phrase "Conformité Européene" which literally means "European Conformity". CE Marking on a product, in this case, a Medical Device, is a manufacturer's declaration that the product complies with the essential requirements of the relevant European health, safety and environmental protection legislation. What are Competent Authorities and Notified Bodies? There are 28 Competent Authorities in the EU (same amount as countries). In the UK the Competent Authority is the Medicines & Healthcare products Regulatory Agency (MHRA). Each country has a number of Notified Bodies who you can work with to ensure you to meet the rules in the ISO standards, which we were told there are a whopping 1000+ rules with 300 of them for MDs. The BSI is the most well known in the UK but you can choose to work with one from another country if you want. There is no need to work with a Notified Body is you want to do the work yourself - you can purchase the ISO standards online. They are expensive but Richard gave a good tip when telling startups to do their research and only get the ones you really need, and funnily enough, they’re much cheaper to buy from Latvia. Richard then went on to talk about the effect Brexit would have on these regulations and if you’d need an EU representative. As Britain makes up ⅓ of the market in the world, Richard predicted that Brexit shouldn’t affect MDs, as long as you have a Notified Body to support you - such as the BSI. Richard also recommended startups think further ahead to the global environment for MD regulation if they plan on exporting their product. For example, in the US you need to comply with FDA and in Canada, the CMDR. Luckily, five countries (Australia, Brazil, Canada, Japan and the United States) have come together with the UK to create the Medical Device Single Audit Program (MDSAP) which allows a single audit of a medical device manufacturer's QMS which satisfies the requirements of multiple regulatory jurisdictions. 1. Understand and comply with the current regulations (Medical Device Directive) Firstly you need to determine the class of the MD. There are six categories of medical devices from Class 1 to Class 3. You can self-certify Class 1 devices as they carry the lowest risk of harm. The other classes need to be assessed by a Notified Body. Annex 9 of the Directive has 18 rules to determine which class your device is and if still unsure check out the MEDDEV 2. 4/1 Rev. 9 June 2010. Once you have determined your Class, you can determine how you meet the requirements which are called “Route to Conformity” which range from self-certification (Annex 7) to testing at a 3rd party laboratory (Annex 3). Lastly, make sure your device meets the essential requirements in Annex 1 to ensure your product is both safe and effective. Richard gave us an overview of the new Regulations that are coming into law in 2020. Although there are 123 articles instead of 23 articles in the current Directive, there are not that many changes. Classification remains the same but Annex 8 has 22 rules for classification instead of 18 in the Directive. Annex 2 now contains the definitions. The Regulations has five different Routes to Conformity. And Annex 1 still contains the essential requirements to ensure your product is both safe and effective. New in the Regulations is making post-market surveillance (PMS) and post-market clinical follow-up (PMCF) mandatory. PMS is a system that provides continuous feedback about a device on the market in order to maintain a high standard of product quality. PMCF can sometimes require you to conduct additional clinical investigations, called PMCF studies. A Quality Management System (QMS) is a set of processes within the organisation to identify, measure, control and improve core activities to meet customer and regulatory requirements applicable to your organisation’s medical devices. It’s a legal requirement under the ISO standards. Think of your QMS as a framework for all your business processes. The standards essentially are looking for evidence that you have documented all procedures for design and development of your device. The standard ISO 13485 explains what you need to have in your QMS and the 29 (+4) requirements. Richard recommended that when you are starting out only look at clauses 4 to 8 that you need to comply with to start. He recommended creating an Excel sheet that can be shared with all the team with hyperlinked relevant documents especially using flow charts to explain your processes. Richard emphasised the importance of planning your medical device from concept to launch. A legal requirement under the Directive and the Regulations is to develop a Technical File which will help with your step by step planning. 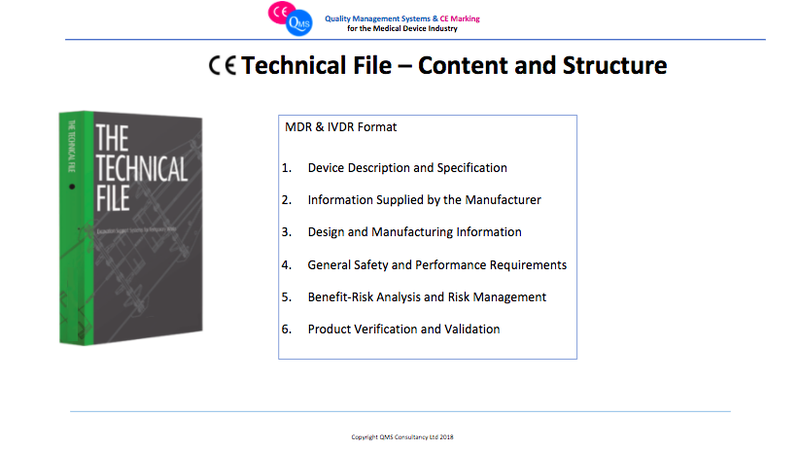 A Technical File includes detailed information about the design, function, composition, use, claims, and clinical evaluation of your medical device. It will normally be examined by a Notified Body except if you are self-certifying under Class 1. Thanks again to Richard for sharing his wisdom. If you would like to contact Richard for a no-obligation chat about how he could help you with CE Marking process or any queries about medical devices, you can contact him here. See you here same time same place for our next Lunch&Learn on 29 May when Dr Asif Qasim from MedShr, which allows medical professionals to share and discuss clinical cases to improve patient care on a secure, encrypted platform, will be offering his advice and experiences, as MedShr exceeds >500,000 users in >180 countries.